A lot of us love shopping, but how much do we really understand about the shopper? Online and offline shopping are becoming more integrated. It used to be the case that some shoppers browsed in shops and bought online in order to get the best deal, but there is evidence that this practice is being reversed. More consumers are doing more of the browsing online, but they want to see the ‘real thing’ in retail stores and bene t from the instant gratification of buying and receiving the product there and then. Online retailers need to rely on home delivery, something that is becoming a greater inconvenience to consumers as they spend less time at home. According to BDRC, click and collect (i.e. buying online and collecting in a physical store) is now used by 10 percent of buyers of IT, electrical goods, and furniture in Singapore, and almost double that gure among consumers in their 20s. Even Amazon, which built its business through online retail, now sees a need for physical stores. The company already dominates e-commerce, but 90 percent of worldwide retail spending is still in brick-and-mortar stores. Hence, since 2015, Amazon has been ‘dabbling’ in physical stores that also serve to showcase its technology. The company devotes a lot of space to its Kindle e-readers, streaming TV devices, and other gadgets, so customers can try them out before buying. 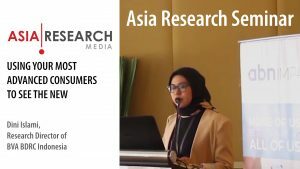 Asia Research explored many areas of retail consumer insight at its Q3 Jakarta research seminar, held at the Gran Melia Hotel in July. The event, on the theme of ‘Getting to the Heart of the Shopper’, was attended by retailers and consumer goods brand owners, and included papers by PRS IN VIVO, BDRC, and Research Now SSI. These papers covered the latest in shopper insight, retail analytics, and a new approach to measuring retail brand equity. pers, both for traditional offline shopping and for e-commerce. They use retail mock-ups to simulate the retail en- vironments that consumers are in when they make ‘real’ purchase decisions. Eye-tracking technology is integral to understanding the shopper purchase path. Nichole’s paper focused on how behavioural economics impacts the shopper, particularly in the context of over- whelming choices. Nichole demonstrated that, faced with overwhelming choices, consumers generally use their System 1 thinking (i.e. fast and automatic) to make their purchase decisions. Based on extensive shopper research, Nichole showed that only 25% of FMCG products in shops get ‘seen’. On average a consumer takes just 0.3 seconds to ‘deselect’ the products that do not interest them, and a maximum of three seconds to evaluate a new FMCG brand that attracts their attention. The so-called ‘three second chal- lenge’ is the time the consumer will give to considering your FMCG brand, and Nichole explained the three key attributes brand owners need to focus on to pass the evaluation stage: visibility, comprehension, and point of difference. 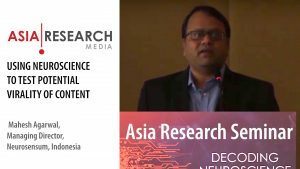 Aristo Labare, Research Director from BDRC Indonesia, presented a paper on ‘Brand Margin’. For a long time, consumer brands have tracked their brand equity using standard metrics of brand awareness, usage, preference, NPS, etc. Based on research conducted by BDRC across a range of categories, including automotive, FMCG, and airlines, they argued that brand equity measures can be improved by understanding the nancial premium con- sumers think brands can attain. While promotions and availability (as in the case of airlines) often determine the final price people will pay for brands within the same product category, the basis of Brand Margin is to assess the underlying premium that a consumer gives to a brand over competitors on an equal footing. In an example from a recent survey conducted by the BDRC Group into long-haul flights, Brand Margin could demonstrate higher brand equity for some airlines, and it was a bigger differentiator of brand equity compared to NPS scoring. With e-commerce, such as online travel agents, brands and prices for the same route and similar timings are usually listed so that it is easy for consumers to make side-by-side comparisons. Hence consumers need to make decisions on how much more they would be willing to pay to fly with particular airlines, or how much less an airline would need to discount in order to win over business for that flight. Brand Margin emulates this approach, and then identifies the drivers of the perceived financial premium for that brand, and which consumers are more likely to accept this premium. Aristo also presented examples applied to automotive goods and FMCG, highlighting an example in which particular brands are actually underselling themselves in these categories. Research Now SSI completed the seminar by discussing the role of analytics for retail. Through work they have conducted in the retail sector, they explained how big data is capable of predicting outcomes from shoppers. In one example, a supermarket in the US (Target) was able to draw cor- relations between women buying cotton balls, unscented lotion, nutrition supplements, and washcloths, and women who would subsequently buy newborn products in six to nine months – i.e. they were able to predict the early stages of pregnancy from purchase behaviour. This allowed them to target promotions effectively at women for what is a very lucrative market. In another example, the P&G haircare brand Pantene partnered with a retailer called Walgreens to monitor weather patterns. When periods of high humidity were expected they adjusted their merchandising arrangements on a store-by-store basis to promote anti-frizz products, which yielded a significant sales uplift. The difference of this application, Research Now SSI argued, is that researchers need to shift from analysing a few thousand cases to millions. Traditional data analysis packages would not be able to cope with this, so new computation packages like Hadoop and programming languages like Python need to be adopted. We also need more ‘data scientists’ than ‘market researchers’. Research Now SSI pointed out that a data scientist’s job involves much more trial and error than that of a researcher. Because of that, each data science project is generally more tightly de ned and less exploratory than a typical research project. But just like researchers, there is real bene t to data scientists specialising in a specific industry or category to gain even more insight. 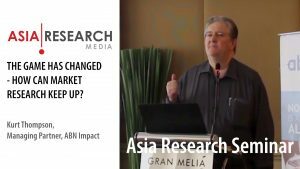 However, despite Indonesia being a ‘big market’, there is so far little adoption of big data analytics in this market, but this is clearly an opportunity going forward.